I think you’ll agree that starting out in the detailing hobby can be overwhelming. If it weren’t, then the most common question about detailing wouldn’t be “What should I buy as a beginner to detailing?” and the auto detailing sub Reddit wouldn’t be filled with people asking detailers to look over their list of potential loot. Not only are there lots of different tools and chemicals, there are dozens of brands and types for each one. Prices also swing wildly from skeptically cheap to absurdly expensive. Well fear not. I’m going to help you cut the mustard so you can get started Detailing without wasting time and money. These are the minimum supplies that give you the best bang for the buck for properly washing and detailing your car. The Compounds, Polishes, Machine Polishers, and Pads are optional if you don’t intend on doing any paint correction (removing swirls, scratches, marring, and hazing of the paint) but I think you’ll be selling yourself short on your results if you skip those. All of my recommendations are an aggregate of my personal experiences as a detailer as well as the experiences of the many detailers I hang out with online on Reddit and forums like Autopia and AutoGeekOnline. 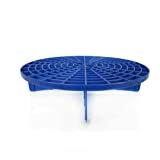 2x Grit Guards – $7.99 ea – You place one in the bottom of each bucket. They act as water brake and dirt trap in the bottom of the bucket so when you’re swirling your wash mitt around you don’t mix the sediment that has dropped to the bottom of the bucket back into the water and on your mitt, reducing the chance of you scratching your car. I find the Grit Guard brand and their identical copies to be the best so get whatever is cheapest. 2x Wash Mitt from The Rag Company – $23.95 – I recommend two mitts so you can dedicate one washing really dirty things like your tires and fender wells. TRC makes high quality stuff for a great price and is highly touted by many detailers. 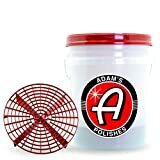 Wheel Woolies – $56.99 – You’ll need these to reach behind your wheel spokes to clean the barrels of your wheels. You most likely wont be able to reach this area with anything else. There are cheaper brushes online such as the EZ Detail Brush that works ok but is stiffer and tends to sling dirty water back on you. 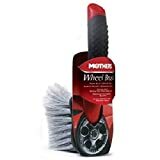 Mother’s Wheel Brush – $6.99 – If your wheels are anything but raw polished aluminum then Wheel brushes will make easy work of washing your wheels. They are soft, but not perfectly soft, so I recommend buying another microfiber wash mitt to use exclusively for wheels if yours are highly polished soft metal like raw billet aluminum. Hose – $39.69 – This is really personal preference. 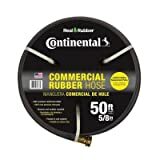 I prefer a real rubber hose like this Continental over the cheap plastic garden hoses. Yes it will be heavier but it’ll probably last your lifetime if you take care of it. Nozzle – $21.97 – I also prefer a firehose nozzle like this. Simple, reliable, effective. Lasts for years. 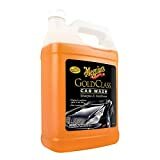 Meguiar’s Gold Class Shampoo – $22.95 – Solid over-the-counter (OTC) shampoo. Cleans good. Rinses good. Cheap. Optimum Car Wash – $15.83 – Typically only available online. My favorite. Very concentrated. Very lubricitous. Cleans great. Rinses great. Has the scent of blueberries. 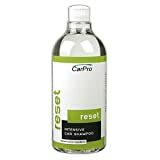 Carpro Reset – $24.99 – No waxes, fillers, or gloss enhancer. It just cleans really well. Typically used before applying a coating but is great for using before paint correction as well or just to see what the condition of your paint is really like. Will not remove or harm waxes, sealants, or coatings so it’s a safe all around shampoo. While I gave three options, you really only need to pick one. It’s not necessary to own all three. Meguiar’s D101 All Purpose Cleaner (APC) – $22.41 – High quality cleaner that can be diluted to clean most automotive surfaces such as plastic, vinyl, and rubber. Used by and recommended by most detailers. Optimum No Rinse – from $11.29 – This is probably one of the most versatile automotive chemicals available. It’s a concentrate that you dilute to use as anything from a rinseless washing solution to a quick detailer and even a clay lube. It’s honestly my favorite in all of those categories. I think every detailer should have a bottle or two. 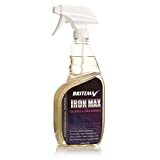 BriteMax IronMax – $15.90 – Used to remove iron deposits from brake dust and industrial fallout that embeds itself into your paint. Every vehicle should have this applied at least once to properly decontaminate the paint. It also makes clay baring much easier afterward. A lot of people recommend Iron X but I prefer BriteMax Iron Max because it’s thicker, cheaper, and just as, if not more, effective. 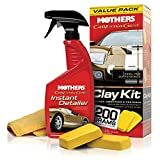 Mother’s Clay Bar Kit – from $16.99 – Mother’s clay bar kit is readily available over-the-counter and is the best bang for the buck for clay, period. The trouble with clay is you have to toss it if you drop it. Because of that I also recommend Nanoskin Fine Clay Mitt as an alternative below since it’s washable and reusable and equally effective, it just cost more for the initial purchase but is otherwise equally effective. 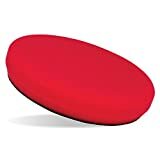 Nanoskin Fine Clay Mitt – $32.99 – Works like traditional clay but can be washed and reused. Ends up cheaper in the end compared to dropping clay and having to toss it. 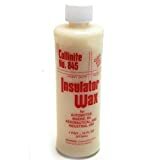 Collinite 845 – $18.95 – My (and many other detailer’s) favorite wax. It’s very durable, lasts longer than most waxes, and a little goes a long way. Optimum Opti-Seal – $24.99 – High quality paint sealant. Deeper shine than wax and lasts much longer (months). McKee’s 37 SiO2 Paint Coating – $45.00 – Very beginner friendly paint coating. Lasts up to two years on a garaged vehicle. One bottle coats 2-3 vehicles. Arguably the most affordable and practical diy “ceramic” paint coating. You only need to choose one of the above last step products (LSP) since you’ll use them exclusively. There is little to no benefit to layering these products. 4x TRC Eagle Edgeless Towels – $19.95 – dense, plush, high pile towels for buffing away waxes and polishes without scratching your paint. 3x TRC Blue Glass Towels – $20.95 – Great for streak free cleaning of windows. One to wash with window cleaner, one to remove the cleaner, and one to buff to a streak free shine. I dub it the three towel method of streak free windows. 2x TRC Platinum Pluffle Drying Towels – $24.95 – Great for safe drying of your paint. One towel absorbs a lot of water so don’t let the 16″x16″ size fool you. You can also buy a 20″x40″ towel but some find them a bear to handle and hard to wring out. The Pluffle is a softer, safer version of the Dry Me a River! towels that are also highly touted. 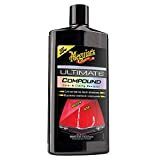 Meguiar’s Ultimate Compound – $16.02 – A very user friendly and effective polishing compound for removing scratches in paint. Most people recommend Meguiar’s M105 but Ultimate Compound is almost equally effective while having a much longer working time and less dusting. All you need to know is that it works great, is super easy to use, is cheap, and you can find it over the counter at most big box stores. Meguiar’s Ultimate Polish – from $7.99 – Finer than Ultimate Compound. Used as a followup to remove any hazing left by the compound. Also cheap, easy, and sold pretty much anywhere. Griot’s Garage 6″ Dual Action Polisher – $161.16 – Dubbed the GG6 by the detailing community, it’s arguably the best bang for the buck as far as performance, comfort, noise, and reliability goes. 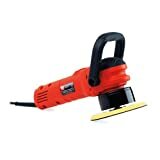 It also carries a lifetime guarantee against defects, something no other polisher has. I’ve used one for half a decade now and it has never let me down. 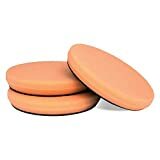 3x Griot’s Garage Orange Correcting Pads – $38.00 – Simple, effective, affordable flat pads for use with a compound like the Ultimate Compound above to remove swirls and other defects using a polisher like the GG6 also mentioned above. Many detailers also recommend Lake Country Pads but I find the Griot’s Garage pads to be of equal quality while being more readily available online. 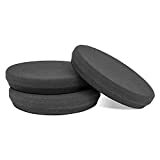 3x Griot’s Garage Black Finishing Pads – $39.99 – Same as above but for use with a finishing polish like Ultimate Polish to followup after using the Correcting Pad with a Compound. 1x Griot’s Garage Red Wax Pads – $12.50 – Same as above but for applying wax or sealants with your machine polisher. I recommend 3 of each of the Correcting and Finishing pads because you’re going to need to change them out after a couple panels due to filling with product and removed paint as well as getting hot from extended use. If you try to use just one of each for a whole car you’re likely going to ruin the pad. If you were to go through my list and buy everything suggested you’ll have a very solid starting kit that’s very user friendly and will give you very good results. Sure, there are a ton more options and combinations of tools, chemicals, and supplies out there and you could assemble an entirely different list and get similar results. But, that just keeps you in the rabbit hole of not taking action. My list is all proven products at what I think are the best bang-for-the-buck in their category. I honestly believe you’ll be satisfied with all of the listed products. As you get more comfortable with detailing you can venture out to other products with your own informed decisions and experience. Feel free to comment below to ask any questions if you’re still feeling stuck. I’d be more than happy to help so we can get you started. Auto Detailing is a super rewarding and instantly gratifying hobby (and potential job choice).